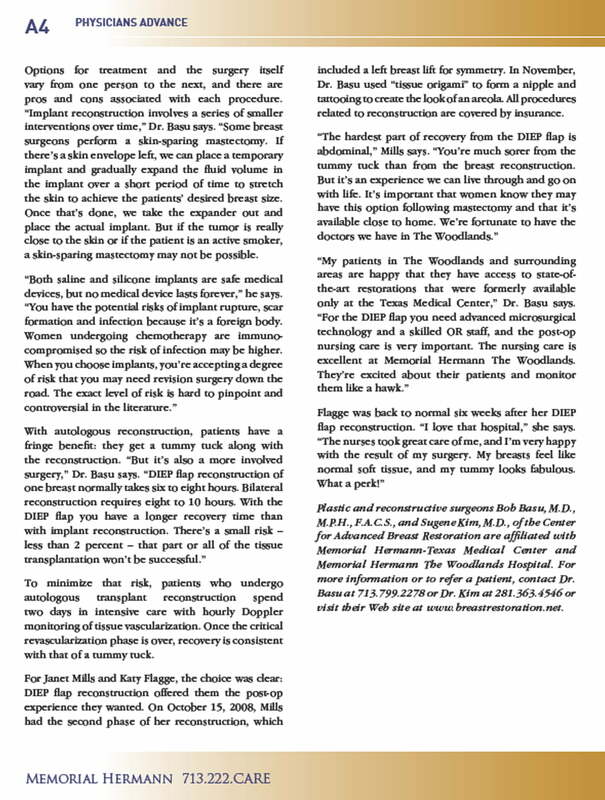 Dr. Basu and his surgical partner, Dr. Sugene Kim, featured in “Physicians Advance” discussing breast reconstruction options at Memorial Hermann the Woodlands. Few plastic surgeons across the country offer breast reconstruction after mastectomy using the muscle-sparing DIEP flap procedure. This revolutionary surgery is now available at Memorial Hermann The Woodlands Hospital from Dr. Bob Basu and Dr. Sugene Kim. 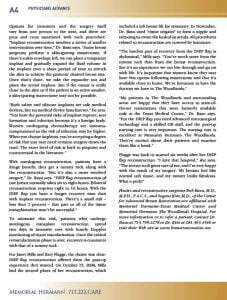 “The DIEP flap is an excellent option for women seeking a reconstructed breast using their own tissue without an implant,” says Dr. Basu, who now performs at least one DIEP flap procedure a week at Memorial Hermann The Woodlands with plastic surgery colleague Dr. Sugene Kim. Plastic and reconstructive surgeons Dr. Basu and Dr. Kim discuss patient options for DIEP flap reconstruction, an advanced microsurgical tissue transplantation of excess lower abdominal skin and fat to the chest wall to create a breast mound.